These two charts come from a deck I published today for Enders Analysis on the current state of the platform wars. Together, they give a pretty good sense of the mobile industry today. The clearest take-away is polarisation: Samsung, Apple and (still) Nokia are operating at a completely different scale to the other branded OEMs, which have neither the volumes of Samsung or Nokia nor the premium ASP and revenue of Apple. Samsung continues to dominate Android globally, with 45-50% volume share (as best anyone can tell, given that Sony is the only Android OEM to disclose unit sales). The other Android OEMs are all struggling to a greater or lesser extent. The growth of Android didn’t change the underlying dynamics: if you were a sub-scale, failing handset maker, adopting Android merely made you a sub-scale, failing smartphone maker. One illustration of this is marketing. Samsung Electronics spent $9.5bn on marketing in the last 12 months, versus $933m at Apple for the 12m to September 2011, $1.45bn at Nokia in 2011 and $4.5bn for Sony in the 12m to March 2012 (these companies only disclose advertising spend annually). 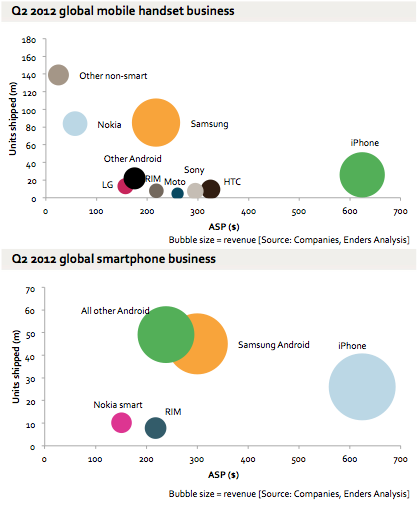 Samsung’s Q2 marketing budget of $2.75bn was larger than handset revenue at LG, Motorola, RIM or Sony. This trend also shows up very clearly if one looks at revenue progression over the last 12m: of the ‘traditional’ OEMs (i.e. excluding Huawei, ZTE and the other Chinese and Indian manufacturers, none of which report handset revenue), only Apple, Samsung and Sony grew: all the others shrank.